Posted by Bruce Carroll at 10:25 pm - November 15, 2006. Now when this happens to a Republican Congressman, he does the right thing and resigns. And if he hadn’t he would have been kicked out by the GOP Leadership for his actions. South Dakota state senator who’s under investigation has resigned his current term, but plans to show up for the new session that starts in January. Democratic state Senator Dan Sutton of Flandreau has been accused of acting improperly with a high-school student who served as a page during last winter’s legislative session. One of Sutton’s lawyers has said Sutton did nothing wrong. In a letter dated today to Governor Rounds, Sutton resigned for the rest of this term but did not step down from the 2007 session. Sutton was re-elected last week with 57 percent of the vote. I guess that’s because it is okay to be a child predator in the Democratic Party (*cough* Gerry Studds *cough*). Posted by GayPatriotWest at 1:38 pm - November 15, 2006. Sometimes it’s uncanny how Bruce and I have similar thoughts on the issues of the day. Last night, before bed, I was collecting links and typing up my notes on Nancy Pelosi’s endorsement of Pennsylvania Democrat John Murtha for House Majority Leader over Maryland Democrat Steny Hoyer, the House’s current #2 Democrat, only to wake this morning to see that Bruce had already posted on the topic. I see her very public endorsement — and her wilingness to lobby Democratic Members on his behalf — as a win-win situation for Republicans. Should Democrats elect Murtha, this gaffe-prone septuagenarian with a scandal-tainted past and an appetite for pork becomes the new face of their party. Hardly a new direction for Congress, rather a return to the policies which helped end the forty-year Democratic majority in 1994. Should Democrats elect his rival, current Minority Whip, Steny Hoyer, it will be a sign that Mrs. Pelosi does not have complete control over her caucus. And members will be more willing to defy her on key issues. Captain Ed agrees, saying that if Pelosi loses this one, “she’s damaged goods right from the start.” He also sees this move as more personal than ideological. She “owes” Murtha for helping him in the past and is “merely repaying the debt.” A similar attitude among Republicans helped ensure their defeat last week. In the words of Washington Post reporter Jonathan Weisman, the move signals “the sizable value Pelosi gives to personal loyalty and personality preferences.” Perhaps she still harbors animus against Hoyer for challenging her in 2001 for House minority whip. Perfect Candidate for House Majority Leader — John Murtha! Posted by Bruce Carroll at 10:52 am - November 15, 2006. Thank you Nancy Pelosi. I mean you haven’t even taken the gavel as presumed House Speaker and already you have created a furor within your Democratic Caucus and handed the Republicans the best political gift they’ve had all year. Thanks Nancy, for giving your support to John “ABSCAM” Murtha — the former Marine and now lying and slanderous Congressman from Pennsylvania. This is what Nancy Pelosi said last week after the Democrats won control of the US House. Democrats “intend to lead the most honest, the most open and the most ethical Congress in history”. Words are bunk, Nancy. Your first decision as House Speaker was to side with a crook and a defamer of the US Marines. What a stick in the eye of your pledge and the stick in the eye of our military men and women in combat. Ruth Marcus at the Washington Post agrees. 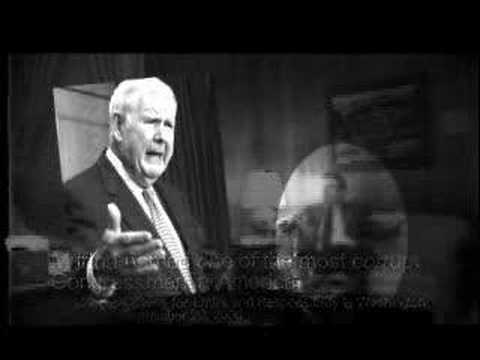 Murtha is unfit to be House Majority Leader. For years Murtha has relied on the Abscam bottom line to argue that the case is not a problem for him: He wasn’t indicted. But he was named a co-conspirator in the bribery scheme. The feckless House ethics committee didn’t take action against him, though the outside investigator it hired quit in disgust after the panel rejected his recommendation to file misconduct charges. “I am the guy that didn’t take the money,” Murtha said this summer when his opponent raised the issue. Yes, but: He’s the guy who, brought into the deal by two other House members — Frank Thompson (D-N.J.) and John Murphy (D-N.Y.) — agreed to meet with men offering money in return for official action. He’s the guy who knew these two colleagues expected a payoff and even vouched for them with the would-be bribers (“Both of them are solid.”). I wrote a few weeks back that Pelosi’s first test as speaker would be whether she picks Florida’s Alcee Hastings — who was removed from his federal judgeship for agreeing to take a bribe — to head the intelligence committee. As it turns out, I was wrong. Pelosi’s first test was how to handle Murtha. Whatever happens [Thursday], she flunked. Whether she’ll get another failing grade on Hastings remains to be seen. Way to go, Nancy. There’s another reason that you are Not My House Speaker. Add that one to your 2006 campaign of “bait and switch” on the American people (Campaigning as Moderates only to Govern as Liberals). Was Iran’s President Involved in 1979 American Embassy Seizure? Posted by Bruce Carroll at 10:37 am - November 15, 2006. Since becoming President of Iran, there have been many stories circulating as to whether Mahmoud Ahmadinejad was one of the Iranian students who seized the American Embassy in 1979. This is the latest one. That episode lasted for 444 days, involved the taking of 52 American hostages, and wound up bringing down one of our most ineffective Presidents (and most traitorous ex-Presidents) Jimmy Carter. I would argue that the Iranian Hostage Crisis was a warning sign about the threat to America by Islamic radicals way before September 11, 2001. Texas Rainmaker highlights this new photographic evidence to suggest that indeed, Mahmoud Ahmadinejad was one of the Iranian students who declared War on America by seizing our embassy. The majority of the pictures were an original report on a street demonstration in honor of the seizure of the “den of the enemy.” But among the many photographs filled with crowds of people, one stood out. Taken from a respectable distance and from behind a barrier, it shows a young man with an automatic submachine gun – presumably one of the participants in the storming of the embassy. Not just anyone from the crowd, however: his submachine gun has a factory casing, as opposed to the more common wood-paneled submachine guns brandished by the students in the other pictures. The young man is standing, leaning tiredly against the wall of the embassy. And when the picture is enlarged, his face comes to closely resemble that of current Iranian President Mahmoud Ahmadinejad. There should be an outcry from all reasonable people if the Iraq Study Group, being spearheaded by former Secretary of State James Baker, calls for negotiations with Iran as a solution. We shouldn’t be kowtowing to the Iranian madman who threatens to annihilate the United States and our allies. Instead, we should send in the Special Forces and capture this man and bring him to justice for his role in the American Hostage Crisis from 27 years ago.